Paul Ryan budget numbers don’t add up: no funding for anything but Medicare, Medicad, and Social Security. Rep. Paul Ryan’s budget would, by 2050, limit budget spending on everything besides Medicaid, Medicare, and Social Security to 3.75 percent. Numbers can be cruel. They take away the soft, gauzy rhetoric that shrouds political platitudes and subject them to a hard-edged reality. So it is for the Ryan budget. The document was lengthy enough that it—and he—automatically acquired gravitas. Yet it was examined carefully by precious few, which is probably a good thing for Ryan. Here is the number that is perhaps the key to his view of the future: 3.75 percent. That number, according to Ryan’s own analysis, is the percentage of GDP that the government will spend by 2050 on everything other than Medicare, Medicaid, and Social Security. In other words, as both the Atlantic’s Derek Thompson and the Washington Post’s Ezra Klein point out, the money spent on education, unemployment insurance, food stamps, environmental protection, infrastructure investment, the NIH, the FDA, the FAA, the FBI, veterans benefits, and most notably, defense—all of these expenditures together can cost no more than 3.75 percent of GDP. So what is the problem? Well, Romney says that defense alone requires 4 percent of GDP—he has pledged that. The way I was taught arithmetic, 4 is bigger than 3.75. That means that their own plans leave absolutely nothing- for these other critical areas of government spending. Let’s say they revise their estimate to 3 percent of GDP for defense, leaving .75 percent for everything else. How much would that be? In today’s dollars: $113 billion. That’s less than the annual budget authority of the department of education alone. 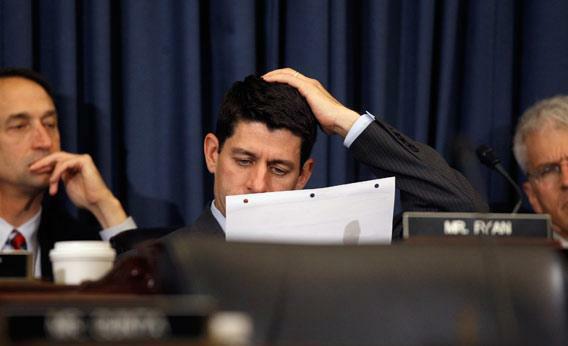 The point is that the Ryan budget simply doesn’t work. “Everything else,” from the Justice Department to the EPA, isn’t going to just shut down. The numbers don’t add up. As the old saying goes: garbage in, garbage out. The Ryan budget dictates that revenues won’t go above 19 percent of GDP, while an aging population will require additional spending in Medicare and Social Security. The document simply does not comport with reality. The Ryan budget, even with its “ending Medicare as we know it,” leaves us with deficits until sometime between 2030 and 2040, with nothing left for anything other than Medicaid, Medicare, Social Security, and defense, and a tax plan that shifts more and more of the burden of all this onto the middle class. This critique is not ideology—this is the simple arithmetic of the Ryan budget, straight from the pages of his own document. The more folks learn about the Romney/Ryan budget, the more folks will realize that it is about as reliable as the fiscal plan of the last person to preach this gospel: George W. Bush.